Even though Phoenix is in the desert, to really understand it you have to follow the water. And I don't mean lack of it, I mean too much of it. That is, flooding. If you don't live in Phoenix, or if you're new to Phoenix, it may seem strange that a desert city would be in a constant battle with flooding. But it's been the story of Phoenix since the 1860s, and it continues to this day. Let's take a look at the Agua Fria River. As of this writing (January of 2017) there is no flood control on the Agua Fria River. Other rivers in the Phoenix area, such as the Salt River, and the Verde, have been controlled for a long time. 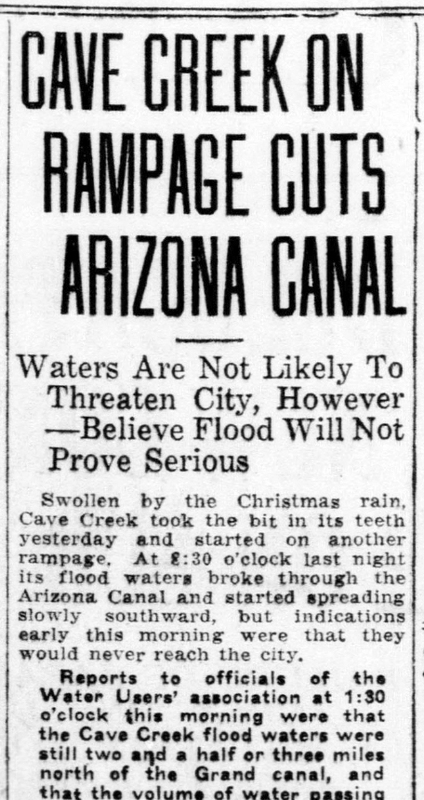 Washes that periodically did catastrophic flood damage to Phoenix have been controlled, such as Cave Creek. 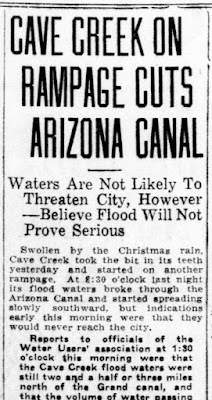 The Arizona Canal has a Diversion Channel next to it that protects the city of Phoenix all of the way to Peoria from flooding that would be caused by an overflow of the Canal (the water flows south). And there are a LOT of other flood control projects that have been created by the Maricopa County Flood Control District, which began in the 1950s. But not the Agua Fria. Take a look at a map of the west valley. The Agua Fria River (which is actually a riparian wash, which means that's usually dry) flows parallel to the 101, going north to south. 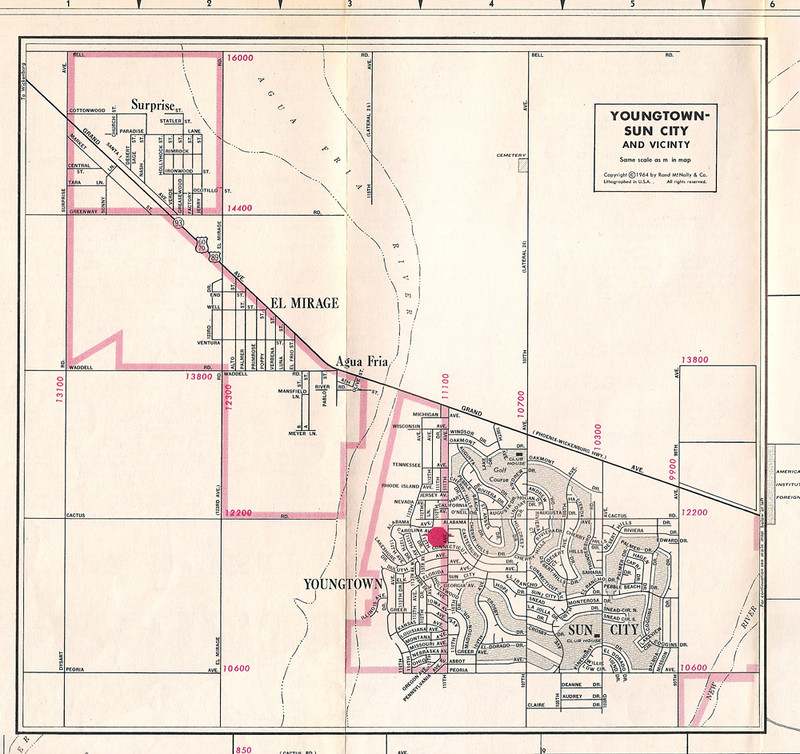 If you take a look at the 1964 map at the top of this post, you can see that it flows between El Mirage and Sun City. And if you're wondering if the engineers have controlled the Agua Fria, the answer is no. It's been a very long time since a catastrophic flood hit that part of the valley. 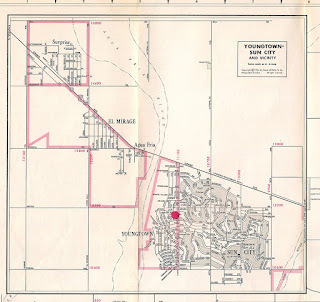 When it did, in the 1930s, the Agua Fria Project was wiped out, and the land sat mostly empty until an Air Force Base was built there in the 1940s (Luke Air Force Base, which is along the Agua Fria Floodplain at about Northern Avenue). The project to control the Agua Fria River will be the next gigantic engineering project in the Phoenix area, and so far I've never heard anyone even talking about it. I sometimes wonder if I'll live long enough to see it? But once it's done, it will be like all of the other flood control projects in the valley, it will work so well that no one will really ever have to think about it again, and people will say, "there used to be flooding there?"